These photos are of the Spinsters' Rock (SX70099078 Butler Vol. 5. p155). 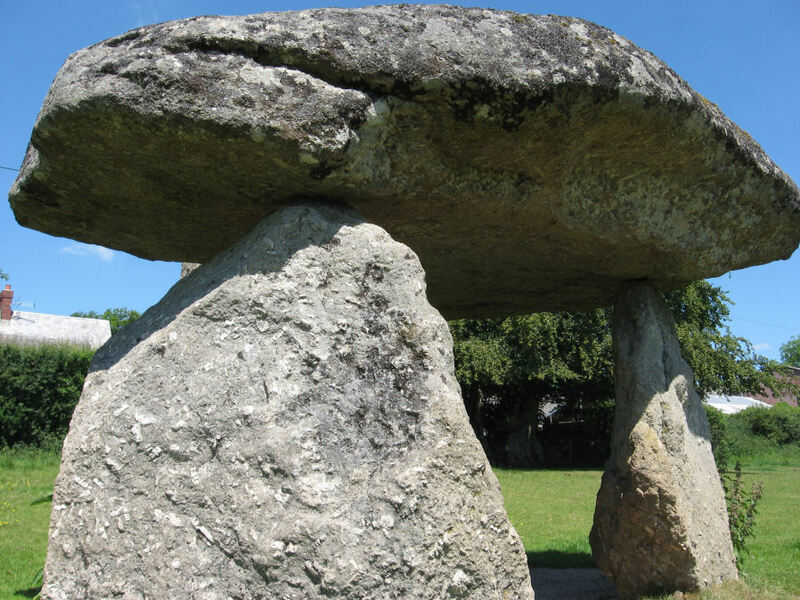 There is a plaque on the gate to the site that states: "A Neolithic burial chamber erected around 3500-2500 BC. This chamber probably contained many burials and would originally have been covered by a long earthen mound. 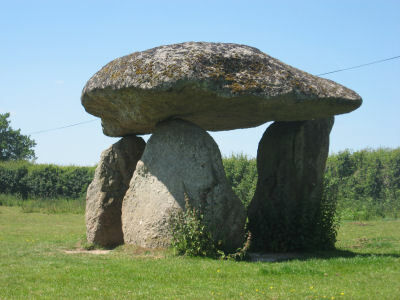 The stones fell down in 1862 and were re-erected in the same year. Traditionally the monument was erected by three spinsters one morning before breakfast". Apparently the industrious spinsters would have been spinners (as in yarn or wool) and the legends and details of its not quite accurate reconstruction are described well on both the Devon Perspectives and Legendary Dartmoor websites (see links below). This site is on the moorland fringe about 3.5k from Drewsteignton. To walk to this site will require walking on road for a few miles (the author cycled there from Exeter). It could be walked to using the Dartline 173 Bus from Exeter to Moretonhampstead via Drewsteignton & Chagford or via Whiddon Down which is a bus stop on the way to Okehampton from Exeter. Probably the nicest way to walk it would be from Drewsteignton to Chagford via Fingle Bridge using the road at Dogmarsh Bridge (SX71318935) to incorporate a trek to Spinsters' Rock. The walk from Fingle Bridge to Dogmarsh Bridge is particularly scenic. The photos below were taken on the 3rd June 2011. Introductory Note: Since this article was written the author has found the following: In 1928 in Devon Notes & Queries Vol 15 there is a short piece by F.C. Tyler referring to having just seen the original manuscript by Swete including the sketch of the circles and announcing his intentions to investigate the site. In 1930 in the T.D.A. Vol. 62 the outcome of these investigations were published. Much of the remains could still be located with some digging and one of the circles and the probable remains of the other were discovered with a pit of charcoal within one of the circles. The original article that follows has been left substantially unchanged but Tyler's results are looked at in a new article A Reappraisal of Tyler's The Stone Remains in Drewsteignton . Public Access Disclaimer: Shilstone Common is private land situated below Bradmere Pool across the road from Spinsters' Rock. There is no public access to Shilstone Common and there are no longer any visible archaeological remains there. If Shilstone Common is viewed in Google Earth, with the current 2002 satellite images, then "grey wethers" can be seen (legend has it that the Grey Wethers circles were sold to a drunken farmer - "wethers" being Old English for sheep). Comparison with other aerial photographs and the accounts of the old antiquarians confirms that nothing remains there at all. There is a public right of way to Spinsters' Rock. A discussion of Spinsters' Rock is perhaps not complete without mentioning claims that there was once a substantial ceremonial complex on Shilstone common near by in the fields on the opposite side of the road. These circles and stone avenues are mentioned in the books of all the old Dartmoor antiquaries and relevant extracts are quoted below. The subject matter and the old history of the first documentation of the sites including Grey's map is also covered in exceedingly good detail on the Devon Perspectives site linked above. It is clear from the literature that the location of these claimed circles and avenues is to the west of Spinsters' Rock in the field on the other side of the road to the south of Bradmere (or Bradford) Pool. Incidentally, Bradmere Pool formed from the remains of old tin workings. The various accounts in the literature imply two stone rows that head almost exactly west to east towards Spinsters' Rock and below this are the supposed circles and other avenues. Such a complex, if it ever existed, would have been constructed probably a millennium later than the original chambered tomb. The literature claims the complex disappeared by being robbed out and the last reference is by Worth who dismisses in a "summary manner" claims about the site. Since Worth there have been no published works that refer to this site. Below we reproduce extracts from the main accounts from the Victorian antiquaries onwards. It is clear that all the accounts originate with the earlier published writings of Swete, Polwhele and with Ormerod who published Grey's map. Should we leave the last word with Worth? A very complete system of rows and circles is said to have existed in close contiguity to the Drewsteignton Cromlech. Unfortunately they cannot now be traced ; and one may be pardoned a little scepticism as to whether their remains ever fell so exactly and elaborately into place as is shewn on a plan prepared by the Rev. Wm. Grey in 1838 [...] Nevertheless I cannot but feel very doubtful - not of the facts observed, but of their interpretation. [...] A double row leading towards the cromlech is shewn on the plan clearly enough; so is another at right angles to it; the outer circle is also distinctly set forth. But apart from the stones of the "avenues," the inner circle is represented by two members only; and the materials indicated for the diverging "avenues" and intersecting circle are quite insufficient for such positive deductions; while there are patent irregularities which it is impossible to bring into the scheme propounded. Nothing short of an exact professional survey could supply an adequate basis for the acceptance of Mr. Grey's plan in its entirety; and that has long been an impossibility [...] The conclusion I draw from such data is that we have ample evidence of the existence of an east and west double row, or "avenue"; and of concentric circles, of which Mr. Grey's "diverging avenues" and "north and south avenues" may very probably have formed part - but of no more. R.N. Worth (text published 1892) - for full quote see below. In 1838 the Rev. William Grey conceived that he had discovered a group of double stone rows associated with stone circles to the west of the dolmen and in the same year, in the company with his brother, he made a plan on the spot, which was completed at the hotel in Okehampton the same evening. The plan was made by pacing only, and the north point was only approximate. Mr. Ormerod prepared a plan from Mr. Grey's data, which plan received Mr. Grey's approval, and was published by Ormerod. It must be said that if any such discovery could have been proved it would have established the former existence of a group of circles and rows which for complication and incomprehensibility would be unique. There have been and still are some few standing stones, but none of these, scattered as they are, can be made to do the duty for any part of Grey's supposed discovery. 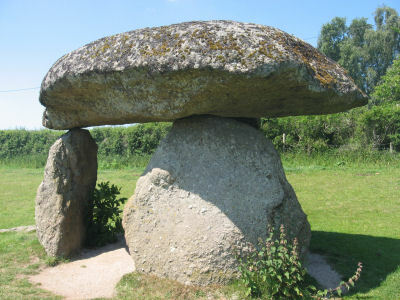 Swete, in 1779 [sic], "in the adjoining field to the West" (of the dolmen) "remarked several conical pillars about 4ft high. On the Southern side there are three standing in a direct line from East to West, the distance from the most Western one to the middle one was 212 paces, from the middle to the one on the East 106, just one half of the former, by which it would seem that an intermediate one at least had been removed. In a parallel line to the north are two other remaining erect, the one from the other distant about 52 paces, nearly one fourth of the greatest space on the opposite line, the area between is 93 paces, in the midway of which at the Eastern extremity stands the Cromlech." It will be seen that this description involves five stones in all, three in a line which is at least 795 ft in length, and in a parallel line, 232 ft away, two other stones 130 ft apart, a most exiguous via sacra, for such Swete held it might have been. Grey attempts to account for 105 stones. Andrews in 1789 makes no mention of any standing stones. Polwhele at first contents himself with a verbatim copy of Swete, and later adds to the "two rows of pillars," "several columnar circles", but condescends to no detail. N. E. in or before 1796, Lysons in 1807 and Rowe in 1828 are all silent, but, in 1848, Rowe writes that Polwhele's "two rows of pillars marking out the processional road of the Druids, and several columnar circles will now be sought in vain, even if they existed, to the extent described by the author". Swete's account was from 1789 not 1779. N.E. is known to be JohN SwetE. R.H. Worth's sceptical comments went much further than his father R.N. Worth who had conceded that "we have ample evidence of the existence of an east and west double row, or 'avenue'; and of concentric circles [...] but of no more". R.H. Worth's comments were based on the available published works of the day. These notably included the publishing of Grey's map by Ormerod (see below) in the Report & Transactions of the Devonshire Association Vol. 5 (1872) and The Archaeological Journal Vol. 29 (1872). The map produced by Ormerod includes details of stones that originate from the report of the site from Polwhele, from Grey's account and from his own observations (see map below with a key that clarifies whom observed what stones). 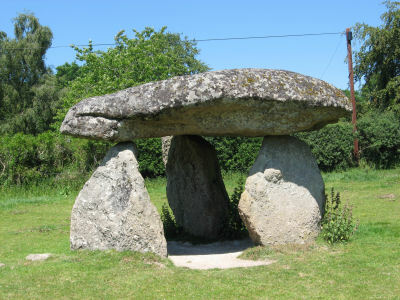 The modest 5 stones and some circles became an extraordinary and elaborate complex of "Druidical avenues" with 105 stones in Grey's account. It is no surprise that R.H. Worth was so dismissive. Many sites on Dartmoor have random clitter which could be mistaken for monumental stones and it could also be the case that former remains had been scattered by ploughing or any other disturbance. Ultimately R.H. Worth is correct to say that Grey is the only observer of Grey's account. The other significant published account was the writings of Polwhele which Worth observed were based on the 1789 account given by Swete in a Tour Across Dartmoor in to North Devon which was first published in Devon Notes & Queries in 1901 (see extracts below). An adapted version of this was published in 1796 under the title On some of the more remarkable BRITISH MONUMENTS IN DEVON published in the Essays, by a society of gentlemen, at Exeter. However this article (as can be seen below), whilst including a discussion of the Drewsteignton Cromlech, and also an interesting discussion of the Urn found in a cairn on Haldon Hill by his father Nicholas Tripe, does not mention the circles and rows on Shilstone Common. Cairn circles on Shilstone Moor? The handwritten Illustrated Journals of the Reverend John Swete were donated to the Devon Records Office in 1959 and they were transcribed and published in full for the first time in 1997 in the remarkable five volume Travels in Georgian Devon. The first excursion in Volume One is the account mentioned above. It includes Swete's watercolour sketches including a sketch of two adjacent stone circles. Whilst some of Swete's sketches were reproduced in the original Devon Notes & Queries article the sketch of the circles was not published although it is mentioned in the text - the "author gives a sketch of the two circles". It looks likely that Swete saw cairn circles. The description suggests a circular mound with stones deeply embedded as curb stones to hold the mound in place. The only puzzle is the size of 31 paces (or yards). This would be around 28 metres for the diameter. The stone circles on Dartmoor vary from 18 to 38 metres. The cairn circles are typically much smaller being around 5 to 10 metres although some are considerably larger. We have dwelt on this subject because it is of some historical archaeological interest. There is plenty of evidence that the Bronze Age builders of monuments utilised earlier monumental sites and it would be of no surprise if they did so with Spinsters' Rock. The only thing that is totally certain is that nothing remains of any monuments on Shilstone Common. The sketch by Swete of the circles is compelling evidence that there were probably once cairn circles on this site. The claimed stone avenue based on 5 widely spaced stones apparently making two widely separated rows seems very unlikely to constitute an "avenue" but often rows are associated with cairns so it is possible there was once one or more rows originally on the site which could have made it a Ceremonial Complex like those found at Merrivale and Shovel Down. Claims that the monuments were Druidical or represented some kind of astronomical alignment should however be treated with a large pinch of salt! Polwhele, Richard . 1793. Historical Views of Devonshire Vol. 1. p. 61. Polwhele, Richard . 1797. History of Devon Vol. 1. p. 150. 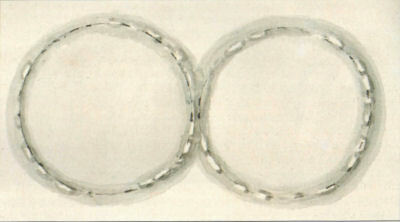 Swete's sketch of two prehistoric-circles, Drewsteignton (DRO, 64M/F1/61) reproduced with permission from Devon Records Office. Also the author would like to thank Devon Perspectives for the very helpful correspondence about an earlier version of this page which helped to significantly change its content which had originally largely agreed with Worth's conclusions. In particular being guided to Swete's A Tour Across Dartmoor Into North Devon in Travels in Georgian Devon was a revelation. Thanks to Devon Perspectives! Report & Transactions of the Devonshire Association Vol. 5 (1872) (spelling and punctuation is from the original article). Observed by the Rev. R. Polwhele prior to 1793, and mapped by the Rev. William Grey in 1838. 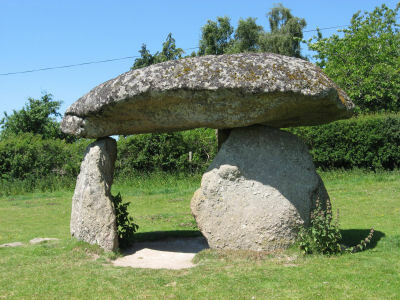 The questions "by whom" or "for what purpose" the Drewsteignton Cromlech was erected will be carefully avoided; the sole object is to record the very extensive Circles and Avenues which formerly existed there, and which have been now removed. Polwhele, in his Historical Views of Devonshire (1793), vol. i. page 61, and History of Devon (1797), vol. 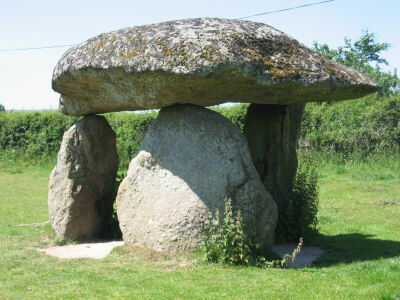 i. page 150, when describing the Cromlech at Drewsteignton, writes thus : "Towards the west of the Cromlech are several conical pillars, about four feet high. On the south side there are three standing in a direct line from east to west. The distance from the most western to the middle is two hundred and twelve paces; from the middle to that on the east one hundred and six - just one-half of the former ; by which, it would seem, that an intermediate pillar at least had been removed. In a parallel line to the north are two others, remaining erect, the one from the other distant about fifty-two paces - nearly one-fourth of the greatest space on the opposite line. The area between is ninety-three paces, in the midway of which, at the eastern extremity, stands the Cromlech." 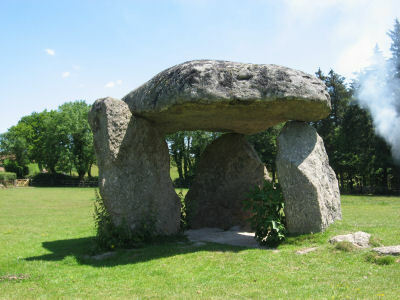 He further adds, in the Historical Views (page 94), and History of Devon (page 154) : "At Drewsteignton the Cromlech is placed on an elevated spot overlooking a sacred way, and two rows of pillars, and several columnar circles." "Wednesday, 4th July, 1838. Visited first, from Moreton, the Druidical Circles above the Cromlech. 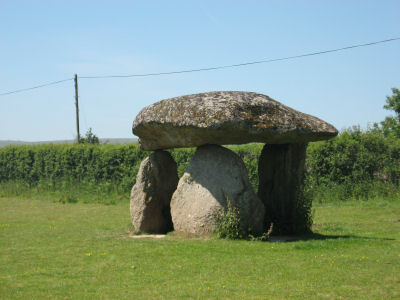 The Cromlech lies in a field about one hundred and ten yards to the east. Here are two concentric circles of stones, the inner circle having entrances facing the cardinal points, that to the north being sixty-five paces in length and five broad. The outer circle, besides these, has avenues diverging towards N.E., S.E., S.W., N.W. ; a smaller circle seems to intersect the larger, of which the avenue eastwards is very evident." The plan was made by Mr. Grey and his brother on the spot, on the morning of July 4th, 1838, and was completed by him on the evening of the same day at Okehampton. These remains are, doubtless, the "Sacred Way," the "two rows of Pillars," and "Columnar Circles," noticed by Polwhele. As Mr. Grey does not mention the pillars to the north and south of the Cromlech, it is probable that the work of destruction had commenced before his visit. 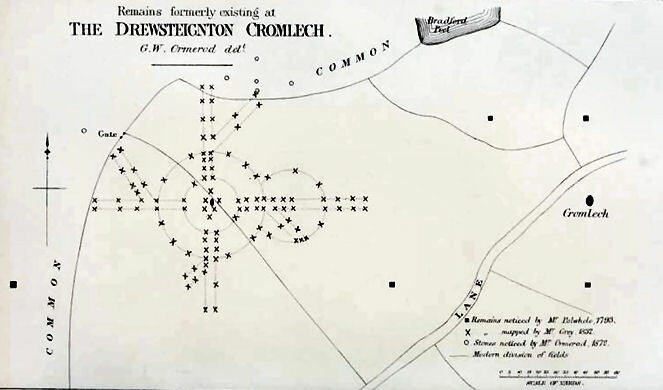 The remains mapped by Mr. Grey were situate on the westerly side of the Cromlech, on the land now occupied by two fields; in the most easterly of these no large stones now are seen, in the adjoining field many stones remain near the gate to the common, and in the upper part some are seen which possibly formed part of these circles and avenues. By permission of Mr. Grey, his plan has been reproduced on a larger scale, and the stones described by Polwhele have been also inserted. As the distances are given in paces, the map cannot be considered strictly correct. A pace has been taken as a yard. COMMENT BY PREHISTORIC DARTMOOR WALKS: If Grey's stones are removed there is very little left. As Ormerod points out the map cannot be considered to be "strictly correct". It could be that the western most stone of Powhele's southern row coincides with the singular stone observed by Ormerod to the west of the gate (the other two having been robbed out) - although this would imply the row was not quite exactly on the claimed east-west axis. This could then place the bulk of Grey's stones as being south of the row which could fit with an embellished, scattered or simply inaccurate version of the circles that Swete described. The map above is actually reproduced from from another article by Ormerod which also describes the site: Notice of the fall and restoration of the Spinster's Rock (The Archaeological Journal Vol. 29 1872) and is identical the one that appears in Vol. 5 of the T.D.A. This is a slightly improved version of the map that appeared a year ealier in Vol. 4 of the T.D.A. A later variant on the Vol.5. map appears in the H.H. Boddy collection on the Dartmoor Archive website, which can be seen here. Extract from The Stone Rows of Dartmoor in Report & Transactions of the Devonshire Association Vol. 24 (1892) (spelling and punctuation is from the original article). "two concentric circles of stones, the inner circle having entrances facing the cardinal points, that to the north being 65 paces in length and 5 broad. The outer circle, besides these, has avenues diverging towards north-east, south-east, south-west, and north-west. A smaller circle seems to intersect the larger, of which the avenue eastwards is very evident." These remarks, entered by Mr. Grey in his journal at the time, unquestionably represent the impression made upon his mind, and the map as reproduced by Mr. Ormerod was approved by him. Nevertheless I cannot but feel very doubtful - not of the facts observed, but of their interpretation. 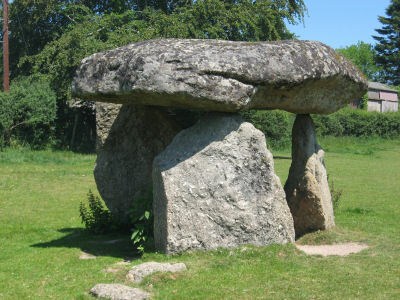 A double row leading towards the cromlech is shewn on the plan clearly enough; so is another at right angles to it; the outer circle is also distinctly set forth. But apart from the stones of the "avenues," the inner circle is represented by two members only; and the materials indicated for the diverging "avenues" and intersecting circle are quite insufficient for such positive deductions; while there are patent irregularities which it is impossible to bring into the scheme propounded. Nothing short of an exact professional survey could supply an adequate basis for the acceptance of Mr. Grey's plan in its entirety; and that has long been an impossibility, for when Mr. Ormerod examined the ground in 1872 he did not find a single stone which could be identified on Mr. Grey's map (the distances on which, by the way, were given only in paces), though others in the vicinity (not on the map) were observed! Either they had all been removed in the interim, and others provided, or the plan was excessively inaccurate. Mr. Ormerod, moreover, with all his inquiries, was unable to find more than two people who recollected the remains at all; and they remembered an "avenue" leading east and west in a line with the cromlech, but nothing more. 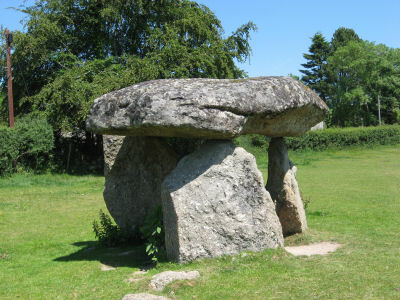 The only other references to these remains are by Polwhele, who says: " At Drewsteignton the Cromlech is placed on an elevated spot overlooking a sacred way and two rows of pillars, and several columnar circles. "* While elsewhere,** in describing the cromlech, he mentions simply the existence to the west of five conical pillars about four feet high. This was in 1793. Nor could either of these stones be found by Mr. Ormerod. The conclusion I draw from such data is that we have ample evidence of the existence of an east and west double row, or "avenue"; and of concentric circles, of which Mr. Grey's "diverging avenues" and "north and south avenues" may very probably have formed part - but of no more. * History of Devon, 164; Historical Views of Devonshire, 94. ** History, i. 150 ; Historical Views, 61. The full passage is: "Towards the west of the Cromlech I remarked several conical pillars, about four feet high. On the north side there are three standing in a direct line from east to west. The distance from the more western to the middle was two hundred and twelve paces - from the middle to that on the east, one hundred and six - just one-half of the former; by which it should seem that an intermediate pillar, at least, had been removed. In a parallel line to the north are two others remaining erect, the one from the other distant about fifty two paces, ... this Druid way ... was intended to inspire those who were approaching the monument, from Dartmoor, with greater awe and reverence." Published for the first time in 1901 in Devon Notes & Queries Vol. 1. (spelling and punctuation is from the original article). In an adjoining field toward the West I remarked several conical Pillars about four feet high. On the Southern side there are three standing in a direct line from East to West, the distance from the most Western one to the middle one was 212 paces, from the middle to the one on the East 106, just one half of the former, by which it should seem that an intermediate one at least had been removed. In a parallel line to the North are two other remaining erect, the one from the other distant about 52 paces, nearly one fourth of the greatest space on the opposite line. The area between is 93 paces in the midway of which at the Eastern extremity stands the Cromlech, and if conjecture may be permitted I should not scruple to assert that this originally grand Vista or Druid way beginning on the environs of the Cromlech as soon as rising from the valley it became visible was intended to inspire those who were approaching the Monument from Dartmoor with greater awe and reverence.* . . .
* These stones were similarly described by Polwhele in Historical Views of Devonshire, 1793, who appears to have adopted Rev. J. Swete's measurements. In 1838, Rev. W. Grey, of Exeter, mapped some remains of circles in a field West of the Cromlech, of which no traces have been found although searched for by the late Mr. G. W. Ormerod. For full account and plan vide Transactions Devonshire Association, Vol. V, 1872, page 73.- Eds [Devon Notes & Queries]. Published in the Essays, by a society of gentlemen, at Exeter (1796) pp.106-130 this article is in part an adaptation of A Tour Across Dartmoor Into North Devon. It is reproduced here for the sake of "completeness" and to allow easy confirmation that Swete's description of the rows and circles on Shilstone Common is not included. The circles are mentioned in the 1901 publication of A Tour Across Dartmoor Into North Devon but Swete's sketch of the circles were not published until 1928 when F.C. Tyler made the sketch available in the journal Devon Notes & Queries Vol 15. It took over 200 years before they had wider circulation in 1997 in Travels in Georgian Devon. Please note Spinsters Rock has public access but Shilstone Common does not include a public right of way.